The electoral threshold is a hotly debated topic. Those who argue in favour, stress that thresholds function as a protectionist measure against political fragmentation and against radical movements. Opponents critically claim that thresholds interfere in the equal opportunities of political parties and suppress the democratic representation of every single vote. Recently, several countries adjusted their legal electoral threshold. With the re-opening of the debate on their benefits and drawbacks, it is important to obtain credible causal evidence on how thresholds affect political representation. In a recent publication Thushyanthan Baskaran and Mariana Lopes da Fonseca study the effects of electoral thresholds on political representation, relying on a reform in the German federal state of Hesse that abolished a 5% threshold for local elections. Given that all municipalities were affected by the reform, no clear obvious control group exists against which to assess the impact of the abolishment. Thus, the economists make use of a law mapping population to council sizes to identify the different degrees to which municipalities were exposed to treatment: By law, council size expands with population size and thus district magnitude works as an explicit threshold inasmuch as low magnitudes have the same effect as high thresholds on limiting the chances for relatively small parties to achieve representation. Therefore, the abolishment of the electoral threshold had a more important impact on larger municipalities. Using a dataset that includes all 426 Hessian municipalities over the period 1989–2011 and exploiting the discontinuities in a state law that maps population exogenously to council size, Baskaran and Lopes da Fonseca implement a difference-in-discontinuities design. They show that electoral thresholds appear to have a substantial causal effect on political outcomes. Abolishing the explicit electoral threshold in the long run increased the vote and seat shares of relatively small local parties at the expense of more established medium-sized and larger parties. The authors find that the increase in the local parties’ seat shares is explained by changes in voting patterns, which suggests that the reform had substantial psychological effects. Also in the long run, voter turnout appears to increase, though to a limited extent. According to the economists, the delayed response to the reform can be explained by the initial uncertainty associated with the reform and the resulting selection of parties. 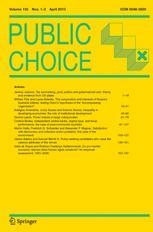 Veröffentlichung: Public Choice, 2016, 169(1), 117–136.